An unusually frank and open forum among government and industry competitors yielded new insights into developing a Gator Landmine Replacement command-and-control system. Traditional land mines have been used for decades by the U.S. Army to “shape the terrain” in order to deny, slow or steer an enemy advance. However, once the mines were deployed, the warfighter lost the ability to control the field. 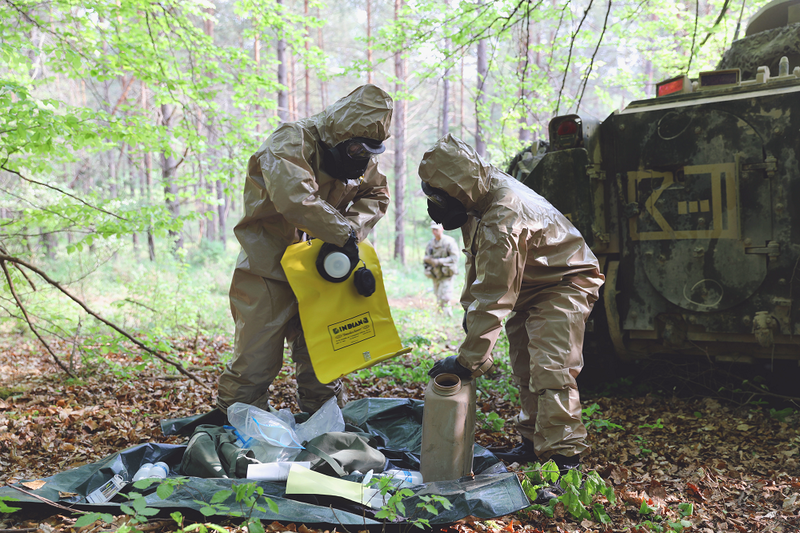 Adding a command-and-control architecture would provide the gateway for the warfighter to remotely arm, fire and assess the status of the minefield. This capability would add a whole new dimension to terrain-shaping, with the ability to selectively turn it off. 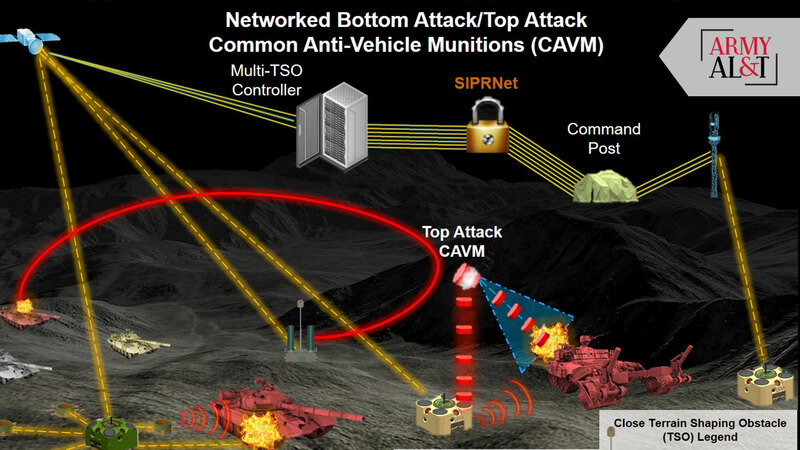 To simplify, a user could create a dynamic munition field that could feed sensor information back to Army mission command to ascertain vehicle movement in the minefield and to allow a remotely initiated lethal response or safe passage. An aging land mine inventory that needed to be replaced created an opportunity at Picatinny Arsenal to push for this capability. The effort is significant, as current policy restricts the use of antipersonnel landmines to systems that have a human in the loop. The requirement for the landmine replacement includes a command-and-control capability in the Gator Landmine Replacement system. (See related article, “A New Way of Thinking,” Army AL&T January – March 2017, page 40.) 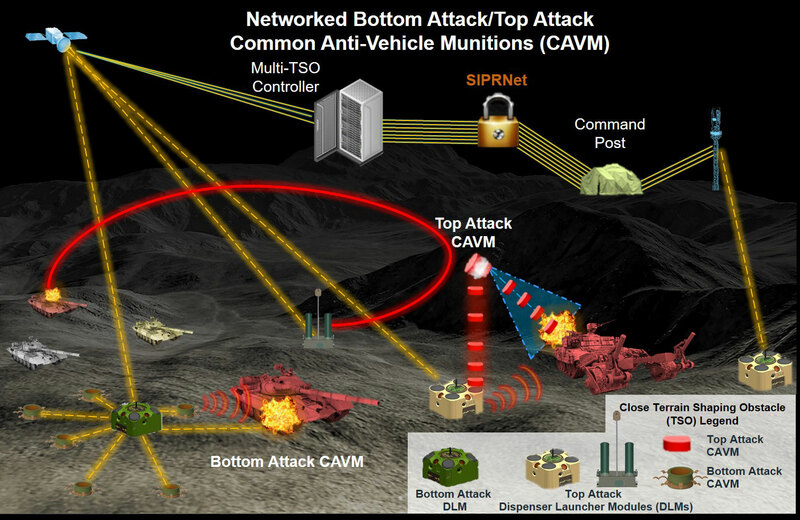 Each munition field consists of three critical components: a bottom attack capability, a top attack capability and a command-and-control architecture to securely network the field back to Army mission command. Part of the difficulty in creating the command-and-control portion of the system is that each building block of a minefield, which can be made up of many building blocks, is 150 by 250 meters. Within a minefield, the munitions must not only communicate with other munitions, but also with the operator-control station. The number of operators required in the loop has yet to be determined. The Product Manager for the Gator Landmine Replacement (PM GLMR) is on an accelerated schedule—milestone A is scheduled for the third quarter of FY 2019, with milestone B just 18 months later—to develop and deliver the next-generation field of munitions for the Close Terrain Shaping Obstacle (CTSO) program. Because of the criticality and risk of integrating a command-and-control capability in terrain-shaping materiel solutions, the Project Manager for Close Combat Systems (PM CCS) engaged industry to assess industry approaches and solutions. PM GLMR is part of PM CCS, within the Joint Program Executive Office for Armaments and Ammunition (JPEO A&A, formerly PEO Ammunition) at Picatinny Arsenal, the Joint Center of Excellence for Guns and Ammunition, in northern New Jersey. Through these industry engagements, PM GLMR has been conducting competitive prototyping activities for the next generation of terrain-shaping obstacles since 2016. That effort culminated in a technology roundup demonstration January – March 2017. 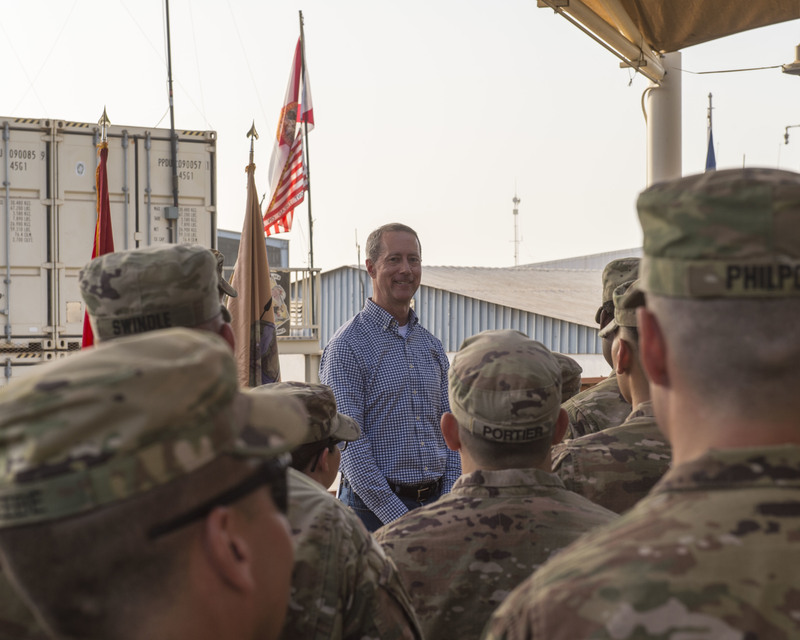 Recently the office undertook an exercise to narrow the focus of prototyping efforts to refine requirements for the command-and-control architecture and make informed decisions on where to continue investing in the technology maturation and risk reduction phase of the program. CCS held the CTSO command-and-control forum on May 15 at Picatinny, with more than 100 government and industry stakeholders attending. This unusually frank and open forum provided the platform for industry to ask questions of not only government representatives, but also of other members of industry, both potential collaborators and competitors. The deputy project manager for CCS kicked off the session stating that the intent was to discuss system-concept options, to allow industry and the government to exchange information on previous accomplishments related to terrain shaping and the current work each contractor was doing, and to provide an opportunity for discussion and collaboration. The intention was to have free and open discussion of program and technology risks. A lot of work was done under government contracts since 2016, and it had to be shared with the entire audience of government and industry stakeholders so that leadership could get accurate feedback to better inform government on how to proceed with a command-and-control architecture. In attendance at the forum was a government panel consisting of leadership as well as experts in communication electronics, encryption and sensors from JPEO A&A; the project manager for Positioning, Navigation and Timing within the Program Executive Office for Intelligence, Electronic Warfare and Sensors; the U.S. Army Armament Research, Development and Engineering Center (ARDEC); the U.S. Army Communications-Electronics Research, Development and Engineering Center; the U.S. Army Research Laboratory; the U.S. Army Maneuver Support Center of Excellence; the Air Force Life Cycle Management Center, and MITRE Corp., a federally funded research and development center. The industry panel consisted of leadership and technical teams from Fantastic Data; Northrop Grumman Mission Systems; Northrop Grumman Innovation Systems (formerly Orbital Alliant Techsystems), which previously fielded legacy Family of Scatterable Mines; Textron Systems, which fielded the M7 Spider mine system and developed the follow-on XMX1100 Scorpion: Intelligent Munitions System; and NAL Research Corp. In preparation for the meeting, the government support team created 12 questions to help meeting facilitators spur conversation. These critical questions encompassed the major focus areas of safety, such as safe passage for friendlies; security and encryption of data; long- and short-haul communication capabilities; acquisition, supportability and general topics. The questions were employed several times to force industry briefers to share more insight into their solutions. With such a large list of players, it was not an easy task for PM GLMR leadership to coordinate and gain agreement from each organization or company to support and brief their respective command-and-control expertise. Nondisclosure agreements between potential competitors had to be created and signed. Additionally, the government prepared internally a list of topics that would be off-limits to protect industry’s intellectual property and maintain trust from the industry participants. These off-limits topics were distributed among the key meeting facilitators so that discussion topics were known by all meeting attendees before the start. Doing this created a sense of mutual understanding between the government and industry that intellectual property would be protected and freer flowing conversation would result. Participants the day-long forum from government and industry presented more than eight hours of briefing material to the audience. This consisted of technical details of the various industry approaches that were investigated and were followed by discussion of the various tradeoffs of each approach. 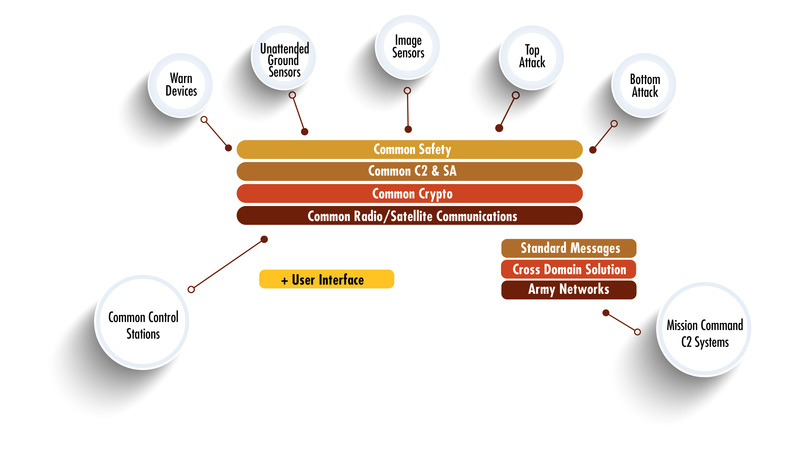 Participants discussed command-and-control high-level capability requirements, such as handling of the message information, encryption, data resilience and security classification. For example, the Fantastic Data team described its approach of creating an inter-nodal network where data could flow between every munition on the field. The Northrop Grumman Innovation Systems team discussed its approach to achieving long-haul communications by integrating Iridium satellite connectivity into the munition field. Textron Systems went into detail on its short-haul and long-haul communication concepts. NAL Research described its road map to get to a system-on a-chip solution. Schedule and performance risks for each industry and government approach were candidly identified by government and industry panels, which, in any other forum, would be sidelined for private meetings individually held between each industry member and government representatives. However, with the ground rules agreed upon and the right people in attendance, the opportunity could not be missed to have these discussions in order to get real-time, honest feedback. This was also a forum to present government solutions, offering opportunities to gain insight into alternate approaches as risk mitigations. The government team presented key networking concepts and encryption approaches to lead the discussion on tradeoffs. Industry members benefited by hearing about government advances such as a new, miniaturized encryption chip developed by the Air Force that enables unattended munition systems to handle encrypted information, a capability that provides a broader look at all potential options for command-and-control approaches. Some of the government solutions were offered up to industry for further analysis and applicability to their concepts. Overall, the forum was a unique opportunity for information exchange among industry members and the government. Its uniqueness was that it was not just a government-to-industry exchange of information, but also industry-to-industry crosstalk. This exchange provided CCS with an opportunity to hear industry competitors ask questions and critique each other’s approaches, giving the government valuable insight for future decisions and investments. Armed with the information presented, CCS is narrowing the focus of its efforts for terrain-shaping concepts and directing aspects of the system be implemented in future phases of the program while ensuring they are not duplicating work across the various contractors. In one instance, the deputy project manager for CCS provided candid feedback directly to one of the contractors on modifications to its approach after seeing what others had presented. The forum also brought to light other technologies that were not previously known by either the program office or the system contractors, such as the Air Force’s encryption chip. The insight and knowledge gained at this forum will enable the program to drive partnerships among industry partners and narrow down potential solutions for the CTSO capability. This type of venue is something the program office will certainly look to pursue again. For more information, contact the authors at waliul.mizan.civ@mail.mil or sean.r.stevens.civ@mail.mil. WALIUL MIZAN is an electronics engineer for ARDEC at Picatinny Arsenal and supports the GLMR program. He holds an M.S. from the Stevens Institute of Technology and a B.S. from the Rutgers School of Engineering, both in electrical and computer engineering. He has more than 15 years of acquisition experience and is Level III certified in systems engineering. He lectures at the Armaments University in the field of applied electromagnetics. SEAN STEVENS is a GLMR project officer in PM CCS at Picatinny Arsenal. He holds an MBA from the Florida Institute of Technology and a B.S. in chemical engineering from the University of Delaware. He has more than 10 years of acquisition experience and is Level III certified in program management. He is a member of the Army Acquisition Corps and a recipient of the Achievement Medal for Civilian Service.